I changed the watch face to one with less animation and my battery life is now upto 3 days, I am guessing if I had zero animation on the watch face I could probably get 4 days battery life, still short of the 7 days advertised. 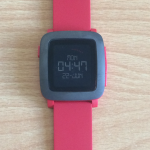 My new Pebble Time arrived in late May after ordering it via KickStarter sometime last year, I have to say I was quite excited to see what it could do. Well one month on what is it like compared to its predecessor which I had on my wrist for well over a year? The new Pebbble Time is much sleaker and less plastic looking than its older sister and the strap is softer which make for a more comfortable fit. The most obvious change is the new colour screen which is nice but can be difficult to see in bright sunlight which was not a problem I had with the previous version. I had read that the battery lasts up to 7 days so was looking forward to not having to charge it every 4 days, that extra few days meant I could charge it on a Sunday night ready for the week ahead. So with the same features on as my old Pebble I am getting just over 2 days of battery life which is about the half of the old Pebble, not happy about that. I can only imagine that the colour screen is doing the damage on the battery. I haven’t tried turning everything off to see if I can match the claimed 7 days battery life but to be honest if your turn everything off you may as well buy your self a cheap digital watch. Well I have been a Pebble fan & supporter since day one and specifically decided to buy the Pebble Time rather than the Apple watch so did I make a mistake? Well I have not tried the Apple Watch so can’t really compare but this is certainly not a revolution and on the face of it looks to be behind Apple already. I think the future of wearable watches is certainly for apps to be able to run locally and have their own 3G/4G connections. In summary its a nice upgrade but nothing life changing and given the cost of £179 this is going to get expensive very fast if they make small upgrades every couple of years and expect customers to always upgrade as they have done with mobile phones.